Hey friends! Welcome to our profile page! 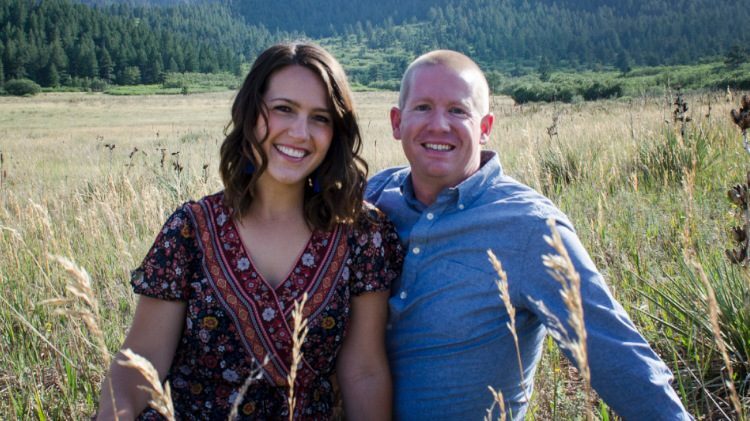 We are Matt and Ashley Winter and we live in the beautiful state of Colorado with our adorable puppy Vader! We have been together for twelve years--married for almost eight. We met our senior year of high school at youth group in Southern California and quickly became good friends. We started dating the summer before college. We used to spend our Friday nights at Disneyland and some of our best conversations happened while waiting in line to ride Indiana Jones, Space Mountain, or the Matterhorn. We dated for four years before Matt proposed in a cute little restaurant built in a 100-year old farmhouse surrounded by Ashley's best friends. We were married eight months later on a beautiful, rainy day in December. We are here now because about two and a half years ago we decided it was time to start a family. We thought getting pregnant would be easy. Months of trying turned into years. We hoped medication would help and even tried some medical procedures to increase our chances. However, each month was met with disappointment. Through the grief and tears we felt God expanding our hearts with the desire to adopt. Through some unique circumstances we found Nightlight Christian Adoptions and made our decision to pursue domestic infant adoption. God is faithful! We have officially completed our homestudy with Nightlight and are approved and waiting. This means we are eagerly anticipating being matched with an expectant birthparent(s). With the help of donations, grants, loans and fundraising we hope to meet the total cost of this adoption. Please don’t hesitate to ask questions. We are so thankful for our amazing community of friends and family who have supported us and prayed for us in this journey from the very beginning. We are forever grateful! WinterBabyisComing and we can’t wait to meet him or her. We are so amazed at how much we have raised in only about 40 days. We also just found out that we have received a grant from Raise the Dough, a non-profit that seeks to help families adopt without going into debt:) We are also still waiting! We haven't gotten any phone calls but we do know our agency is working hard, as they are working with 38 expectant birthmothers currently. We set up a nursery and have been generously gifted with amazing baby equipment. One of our friends is even gifting us breastmilk. God is good. We love you guys and are so excited for you! We are praying in the waiting and trusting God to bring the right baby into the Winter home! Praying the pain of disappointment will soon be eclipsed by the abundant joy of fulfillment. May you be a light to the little one soon to be entrusted to you and to the birth mother who is longing for redemption. May our gracious God bring you just the right baby and just the right mama in his eternally wise way and time. So excited for your growing family! You guys deserve this and I truly hope everything works out! Can’t wait for this little one! You deserve every happiness! Exciting times!! We can't wait to meet the little one who will rock your world. You will make fantastic parents! We love you guys and are so overjoyed and honored to be a part of this journey! We're praying for you and can't wait to see what God has ahead! We're excited to help support you as you prepare to be parents!! We are excited with you as you wait for the arrival of your baby! You have beautiful hearts and your baby will be so blessed to have you as parents! We love you Matt & Ashley!! This is so exciting! God's got this! Let's bring Baby Winter home. What an exciting journey for you both! We are so thrilled to be able to partner with you in a small way. We wish we could be a bigger part of your journey and miss you guys terribly. You both will be amazing parents, and we can’t wait to see all the joy that will come as you walk through parenthood together! Love you both! You will both be amazing parents and we can't wait to share in your joy! So excited for this awesome new chapter of your lives!!! May God continue to bless you Winters. We love you! Thank you for your servant hearts. Can't wait to meet this new baby! We love you guys! Sorry we're so late to the party on this. We're praying for you and know that God has a perfect plan for your new little one! Know that the whole team is praying!!! Go God! Thank You for all the amazing people stakeholders in Ashley’s and Matt’s life, for Ashley & Matt’s heart to share love with their new (to be) family member; for much more than can be written or said!! Praying for you both! Can’t wait to be an aunt! Love you guys! Excited for your family!